I used dried beans, so I had to cook them for 2 hours and then I drained them and put them straight into the food processor, and chopped them up. Add the rest of the ingredients and combine. I added some more lemon juice and water (but you really should keep the water that you cooked the chick peas in) to get the consistency I was looking for. Mix flours and salt together, leaving a well in the middle of the bowl. 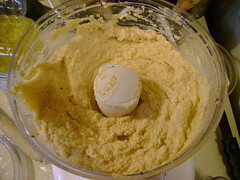 Add water slowly and mix, dough will form. Knead for 10-12 minutes (the hard part). Leave alone for 15-30 minutes. 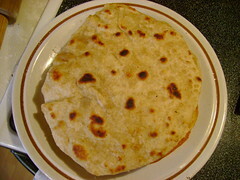 Knead for 1 minute. Divide into 8 balls. Roll each ball out and cook in a skillet, with oil, on medium heat. Lightly oil eggplant and cook on medium heat in a skillet. Combine the rest of the oil, red wine vinegar, garlic, lemon juice, cumin, coriander, salt and pepper in a bowl. 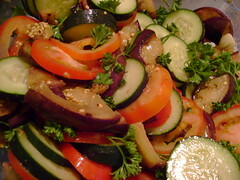 When the eggplant is done, chop slices into quarters and put them in the bowl with the dressing. Mix and let chill in the refrigerator for 2 hours. Then add the sliced cucumber and tomatoes and mix. Sprinkle parsley over the salad. 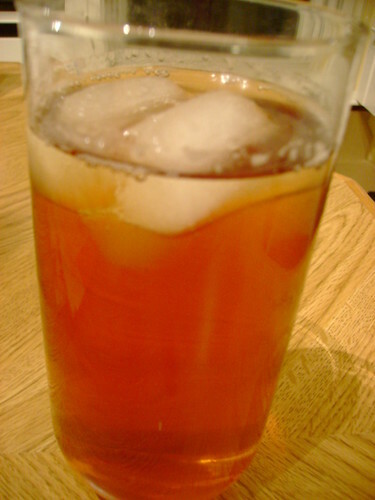 Of course, I have to have my sweet tea.